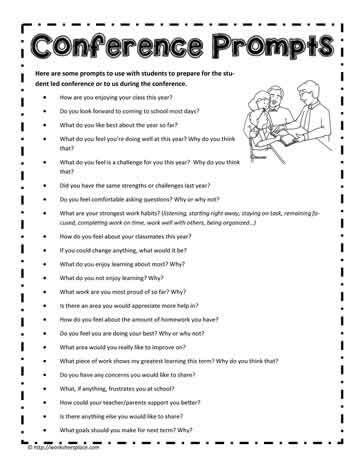 Great interview prompts for the student led parent-teacher conferences. How are you enjoying your class this year? Do you look forward to coming to school most days? What do you like best about the year so far? What do you feel you?re doing well at this year? Why do you think that? What do you feel is a challenge for you this year? Why do you think that? Did you have the same strengths or challenges last year? Do you feel comfortable asking questions? Why or why not? How do you feel about your classmates this year? If you could change anything, what would it be? What do you enjoy learning about most? Why? What do you not enjoy learning? Why? What work are you most proud of so far? Why? Is there an area you would appreciate more help in? How do you feel about the amount of homework you have? Do you feel you are doing your best? Why or why not? What area would you really like to improve on? What piece of work shows my greatest learning this term? Why do you think that? Do you have any concerns you would like to share? What, if anything, frustrates you at school? How could your teacher/parents support you better? What goals should you make for next term? Why?